Can Dean and Matthew survive an encounter with the Merlin? 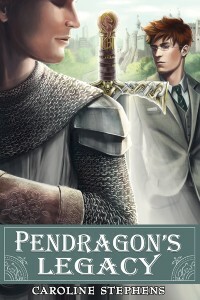 Pendragon’s Legacy by Caroline Stephens, available from Dreamspinner Press. Dean Ryder is a rough and ready PI, the kind of man who will take on any case, just to prove his worth. His lover Matthew? Not so much. Matthew is an English professor who much prefers his books to Dean’s adventures… but that doesn’t mean he won’t ride along when Dean needs him. When Dean meets an old man calling himself the Merlin, Dean and Matthew set out to investigate his claim. Matthew knows the legends, but Dean’s specialty is Matthew’s safety, and he will be working overtime to win the battle of good and evil with his partner by his side. Because if the old man really is who he claims to be, then an old evil is threatening one of the world’s greatest sources of good.